« The Roudenbush Community Center Grand Re-opening! Chick Singer Night (CSN) is the nation’s original and longest-running annual songfest and showcase for women. Join us at CSN Boston to hear great local and regional talent of all ages – all proceeds to benefit the PCA. Currently, CSN is held in 17 cities across the nation and in Sweden. 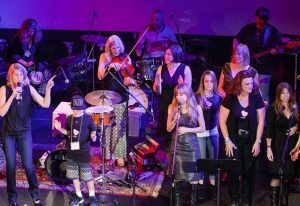 The Boston Chapter of CSN was founded in 2004 and is hosted by Directors Marcia J. Macres of Westford and Jennifer Truesdale of Arlington, both local musicians and business owners.